 To a solution of tert-butyl 5-bromo-2-chlorophenylcarbamate (6-1) (1.0 equiv.) in acetonitrile (0.3 M) and EtOH (0.5 M) was added K2C03 (2.0 equiv.). The reaction was degassed and flushed with N , then added (E)-ethyl 3-(4,4,5,5-tetramethyl-l,3,2-dioxaborolan-2-yl)acrylate (6-2) (1.2 equiv.) 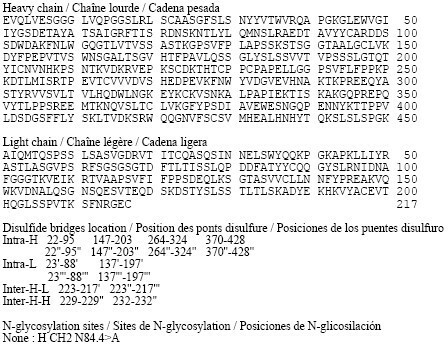 and Pd(PPh3)4 (0.1 equiv.). The reaction was flushed again with N2 and stirred at 100 °C overnight. After cooling to room temperature, hexane was added, and the mixture was filtered through a pad of silica, eluting with EA/Hex (1 : 1) until the product was completely eluted. The filtrate was concentrated and purified on Combiflash, eluting with 0-15% EA in Hex to give (E)-ethyl 3-(3-(tert-butoxycarbonylamino)-4-chlorophenyl)acrylate (6-3) as a white solid. To a solution of (E)-ethyl 3-(3-(tert-butoxycarbonylamino)-4-chlorophenyl)acrylate (6-3) (1.0 equiv.) in ethyl acetate/ethanol (1 : 1 , 0.3 M) was added Wilkinson’s catalyst (0.10 equiv.). Hydrogen gas was introduced via a ballon, and the reaction was stirred at room temperature for 24 hours. The mixture was filtered through a pad of celite, washing with dichloromethane. The filtrate was concentrated in vacuo and purified by Combiflash using 0-10% ethyl acetate in hexane to give ethyl 3-(3-(tert-butoxycarbonylamino)-4-chlorophenyl)propanoate (6-4) as a solid. A solution of ethyl 3-(3-(tert-butoxycarbonylamino)-4-chlorophenyl)propanoate (6-4) (1 .0 equiv. ), 4,4,4,,4′,5,5,5′,5′-octamethyl-2,2′-bi(l ,3,2-dioxaborolane) (2.0 equiv. ), tris(dibenzylideneacetone)dipalladium(0) (0.05 equiv. ), 2-dicyclohexylphosphino-2′,4′,6′-triisopropylbiphenyl (0.20 equiv. ), and potassium acetate (2.0 equiv.) in 1 ,4-dioxane (0.2 M) was degassed and stirred at 100 °C overnight. After cooling to ambient temperature, the reaction content was concentrated in vacuo. The crude material was purified by Combiflash using 0-50% ethyl acetate in hexane to afford ethyl 3-(3-(tert-butoxycarbonylamino)-4-(4,4,5,5-tetramethyl- 1 ,3,2-dioxaborolan-2-yl)phenyl)propanoate (6-5) as a brown oil. The product was stored at -20°C and used within a month of synthesis. To a solution of 4-bromo-3-methylphenol (6-6) (1.0 equiv.) in DMF (0.5 M) at 0 °C was added portionwise 60% wt NaH (1.5 equiv.). The addition was controlled such that internal reaction temperature never went above 10 °C. The reaction was stirred at room temperature for 45 minutes, then a solution of chloro(methoxy)methane (1.2 equiv.) in DMF (3 M) was added dropwise via additional funnel. The reaction was stirred at room temperature for 3.5 hours, and then quenched by pouring into ice. The resulting mixture was stirred at room temperature for 1 hour. Ether was added, and the two layers were separated. The aqueous layer was extracted (lx) with ether. The combined organic layers were washed with water (2x), brine, dried over MgS04, and concentrated to give 1 -bromo-4-(methoxymethoxy)-2-methylbenzene (6-7) as a colorless oil. The crude material was used in the next step without further purification. A solution of l -bromo-4-(methoxymethoxy)-2-methylbenzene (1.0 equiv. ), triethylamine (5.0 equiv.) in DMF (0.5 M) was degassed and flushed with nitrogen. To the reaction was added TES-acetylene (1.05 equiv. ), Cul (0.098 equiv. ), and Pd(PPh3)2Cl2 (0.098 equiv.). The reaction was heated to 60 °C and stirred overnight. After cooling to room temperature, water and ether were added. The layers were separated, and the organic layer was washed with water (2x). The organic layer was separated and passed through a pad of silica (packed with hexane). The silica was eluted with 10% EA in Hex. The fractions were combined and concentrated to give triethyl((4-(methoxymethoxy)-2-methylphenyl)ethynyl)silane as a black oil. The crude material was used in the next step without further purification. point, the ice-bath was removed and the reaction mixture was allowed to stir at room temperature for 45 minutes. The reaction mixture was then passed through a pad of silica (packed with hexane) and eluted with 20% EtOAc in Hexanes to remove insoluble salts. The crude product was then purified by Combiflash using 0-10% EtOAc in Hexanes to give 1 -ethynyl-4-(methoxymethoxy)-2-methylbenzene (6-8) as a slightly brown liquid. A solution of l -ethynyl-4-(methoxymethoxy)-2-methylbenzene (6-8) (1 .0 equiv. ), 3,5-dichloropicolinonitrile (6-9) (0.90 equiv. ), Cul (0.10 equiv. ), and Pd(PPh3)2CI2 (0.10 equiv. ), and triethylamine (5.0 equiv.) in DMF (0.25 M) was degassed and flushed with nitrogen. The reaction mixture was then heated to 60 °C and stirred overnight. After cooling to room temperature, water was added. The mixture was extracted with EA (2x). The combined organic layers were washed with 10% aq NH4OH (2x), brine, and concentrated. The crude material was filtered through a pad of silica (wetted with hexane). The silica was eluted with 10% EA in Hex. The fractions were combined and concentrated. The resulting solids were washed in hot ether and filtered to give a yellow solid, which was used in the next step without further purification. The filtrate was concentrated and purified by Combiflash using 0- 10% EtOAc in Hexanes to give 3-chloro-5-((4-(methoxymethoxy)-2-methylphenyl)ethynyl)picolinonitrile (6-10) as a yellow solid. A solution of 3-chloro-5-((4-(methoxymethoxy)-2-methylphenyl)ethynyl)picolinonitrile (6-10) (1 .0 equiv. ), ethyl 3-(3-(tert-butoxycarbonylamino)-4-(4,4,5,5-tetramethyl-l ,3,2-dioxaborolan-2-yl)phenyl)propanoate (6-5) (1.25 equiv. ), tris(dibenzylideneacetone)dipalladium(0) (0.10 equiv. ), dicyclohexyl(2′,6′-dimethoxybiphenyl-2-yl)phosphine (0.20 equiv. ), and sodium bicarbonate (3.0 equiv.) in «-butanol /H20 (5: 1 , 0.2 M) was degassed and stirred at 100 °C overnight. After cooling to ambient temperature, the reaction content was diluted with ethyl acetate and water. 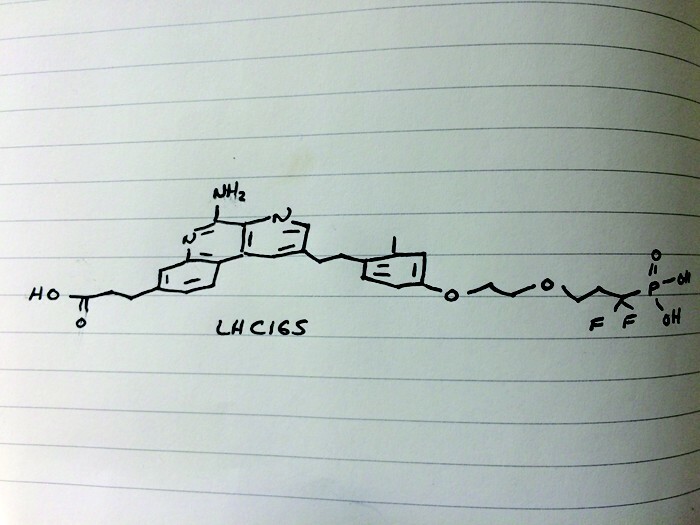 The two phases were separated, and the aqueous layer was extracted twice with ethyl acetate. The combined organic layers were washed with brine, dried over anhydrous MgS04, and concentrated in vacuo. The crude material was purified by flash chromatography on a COMBIFLASH® system (1SCO) using 0-40% ethyl acetate in DCM first to remove the impurity, then 0-4% MeOH in DCM to give ethyl 3-(5-amino-2-((4-(methoxymethoxy)-2-methylphenyl)ethynyl)-benzo[f][l ,7]naphthyridin-8-yl) propanoate (6-11). Further purification was accomplished by precipitating and washing in hot ether. of the alkyne starting material or alkene intermediate was detected. The crude product was purified by Combiflash using 0-4% eOH in DCM to give ethyl 3-(5-amino-2-(4-(methoxymethoxy)-2-methylphenethyl)benzo[f][l ,7]naphthyridin-8-yl)propanoate (6-12) as a white solid. Ethyl 3-(5-amino-2-(4-(methoxymethoxy)-2-methylphenethyl)benzo[fJ[l ,7]naphthyridin-8-yl)propanoate (6-12) (1 .0 equiv.) was dissolved in EtOH (0.2 M), then added a solution of 4M HC1 in dioxane (0.2 M). The product precipitated out as a yellow salt. After stirring for 3 hours, the reaction was poured into a stirring solution of ether. The mixture was stirred for 10 minutes, then filtered and washed with ether. Ethyl 3-(5-amino-2-(4-hydroxy-2-methylphenethyl)benzo[fJ[l ,7]naphthyridin-8-yl)propanoate (6-13) was obtained as a yellow solid which was dried on vacuum overnight (bis-HCl salt). Alternatively, the crude product was purified by Combiflash using 0-5% MeOH in DCM to give the free base. [1 ,7]naphthyridin-8-yl)propanoate (6-15) as an oil which upon standing became a white solid. Toll-like receptors (TLRs) are pattern recognition receptors which play an essential role in the innate immunity, by recognizing invasion of microbial pathogens and initiating intracellular signal transduction pathways to trigger expression of genes, the products of which can control innate immune responses. Specifically, Toll like receptor (TLR) agonists activate innate immune cells through the TLR-MyD88-NFk and IRF3/7 pathways. TLR7, TLR8, and TLR9 belong to a subfamily of TLRs based on their genomic structure, sequence similarities, and homology. TLR7, TLR8, and TLR9 are located in intracellular endolysosomal compartments and show a unique pattern of cell type-specific expression that is thought to be responsible for different pathogen response profiles. Small molecule agonists of TLR7 and/or TLR8 have been reported and shown to activate innate immune responses by inducing selected cytokine biosynthesis, the induction of co-stimulatory molecules, and by increased antigen-presenting capacity. Such compounds include imidazoquinoline amine derivatives (U.S. Patent No. 4689338), imidazopyridine amine derivative (U.S. Patent No. 5446153), imidazonaphthyridine derivative (U.S. Patent No. 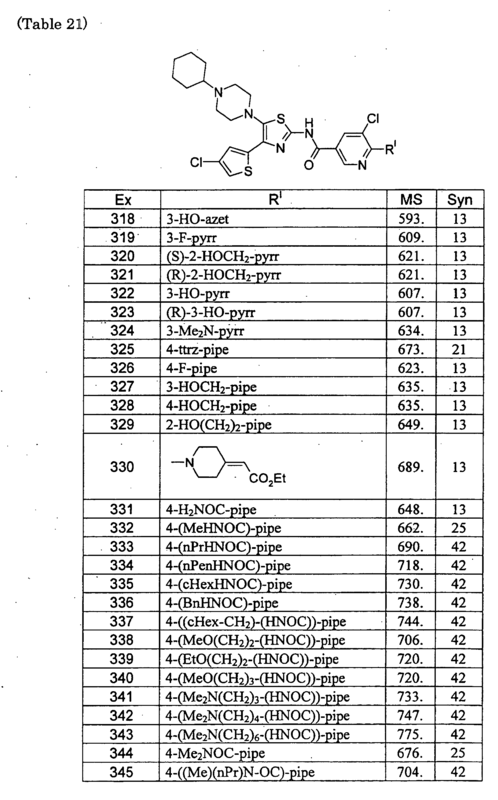 benzonaphthyridine amine derivatives (U.S. Patent Nos. 8466167 and 9045470). The synthetic TLR7 agonist, Imiquimod (1 -(2-methylpropyl)-1 H-imidazo[ 4,5-c]quinolin-4-amine) is FDA-approved in a cream formulation for the topical treatment of cutaneous basal cell carcinoma, actinic keratosis and genital warts, and has limited activity against cutaneous melanoma and breast tumors (J. Immunol. 2014, 193(9) : 4722^1-731 ). Systemic administration of Imiquimod, and structurally similar Resiquimod, is limited by cytokine- mediated adverse effects including severe flu-like symptoms (Expert Opin. Emerging Drugs (2010), 15:544-555). Consequently, Imiquimod is used exclusively in topical applications and is not used to treat deep, non-cutaneous tumors such as melanoma or solid tumors. An injectable lipid modified imidazoquinoline (TLR7/8 dual agonist) that forms a tissue depot with gradual, sustained release which allows for local TLR triggering activity without systemic cytokine release has been reported (J. Immunol. 2014, 193(9): 4722^731 ). However, this compound was shown to be ineffective for large tumors and in addition the serum concentration of this compound 24 hours post subcutaneous administration decreased by approximately 50% (Journal for ImmunoTherapy of Cancer, 2014, 2:12). Therefore, there remains a need for intratumor administration of a TLR7 agonist with prolonged sustained release, which may benefit the treatment of large tumors. Reporter’s notes: Cortez shared another story in the realm of immuno-oncology, although the program that yielded this compound actually started in the world of vaccines. Cortez’s team had been focusing on vaccine adjuvants, small molecules that turn on the immune system to enhance a vaccine’s effect. They developed one such class of compound that activates toll-like receptor 7 (TLR7), a protein in the immune system that recognizes dangerous-looking molecules and can trigger the release of infection-clearing proteins. After observing TLR7 agonists’ ability to induce an immune response with vaccines, the researchers wondered whether the molecules could also be effective in immuno-oncology. They found that LHC165 adsorbed to aluminum hydroxide reduced tumor growth in mice and, intriguingly, showed signs of an abscopal effect, in which untreated tumors shrink concurrently with treated tumors. The implication is that if the immune system recognizes one tumor site, it can recognize others. As with several of the candidates presented throughout the day, LHC165 bears a phosphate group and is injected into the tumor. It’s currently in Phase I trials in patients with advanced malignancies, which means they’ve already tried second and third line therapies, as a single agent and in combination with the checkpoint inhibitor PDR001. By DR ANTHONY MELVIN CRASTO Ph.D in PHASE 1, PHASE1 on April 8, 2019 .